Palm Springs is considered a true gem of a city. Located in the Sonoran desert, this Southern California town has something for everyone. Whether you are spending the day or settling in for a long stay, Palm Springs offer hundreds of shopping, dining and recreational options to fill your time. You can spend the day at a lush golf course or stroll through the streets of vintage shops and little eateries. While enjoying all of the sights and sounds that Palm Springs has to offer, make sure your stay is comfortable and memorable at one of the top-rated Palm Springs luxury hotels, boutique hotels, and luxury resorts. Read on our review of the best 4 and 5-star hotels and resorts in Palm Springs for families, couples, and business travelers. The L’Horizon Resort provides a one of a kind luxury boutique hotel experience. It has the richest and most storied history of all of Palm Springs luxury hotels. Formerly known as The Horizon Hotel, the 5-star luxury resort in Palm Springs was a celebrity favorite in the 50’s and 60’s. Marilyn Monroe, several United States presidents and many other icons have stayed here. Book a visit to enjoy the recent multimillion dollar renovations. The L’Horizon offers a unique experience with 25 bungalows dotting three acres of landscape. Each luxury bungalow provides many amenities, such as private patios and outside showers. The hotel also provides a number of recreational options, such as a pool and badminton court. Just minutes away from the bustling fun of downtown, this is one of the best resorts in Palm Springs for families and couples. The Avalon Hotel is located on four beautiful acres at the foot of the San Jacinto Mountains. As one of the prominent Palm Springs luxury hotels, the Avalon offers guests the choice of staying at a suite or private bungalow. Besides housing numerous types of rooms and 13 bungalows, this boutique in Palm Springs hotel also offers a full-service spa and versatile meeting and wedding spaces. Enjoy being a short walk to all of the excitement of downtown attractions. Or stay on the grounds and enjoy gourmet food and drink from the in-house restaurant and bar, Chi Chi. This desert hideaway is one of the best places to stay in Palm Springs for couples. 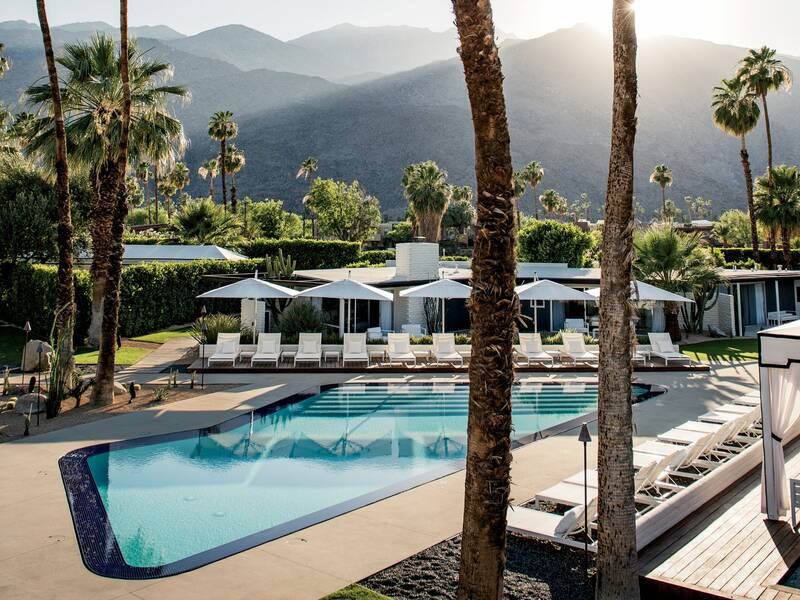 There is a reason that the Parker Palm Springs calls itself the “ultimate desert escape.” Formerly known as Le Meridien, each guest’s every need and want is considered a first priority. One of the best 5-star hotels in Palm Springs, Parker houses several fine dining options. Most notably is Norma’s, a 5-star diner that serves breakfast all day. Relax at the highly rated full service Palm Springs Yacht Club luxury spa. Then you can enjoy the close proximity of top notch casinos, museums, shopping and more. This is definetly one of the most romantic places to stay in Palm Springs. This Moroccan themed hotel is located in the center of Palm Springs. It is known for its restaurant and bar, the Purple Palm, which serves up gourmet food and drinks all day long. The Colony offers special packages to make your stay as perfect as possible. Plan a romantic weekend and indulge your sweetheart at this gorgeous luxury boutique hotel in Palm Springs. The Colony Palm Springs is the winner of the 2016 Conde Nast Traveler Reader’s Choice Award. It also received the Trip Advisor Certificate of Excellence, and is one of the best luxury hotels in Palm Springs for romantic escapes and relaxing getaways. The Willows is one of the most unique of Palm Springs luxury hotels. The Mediterranean villa is nestled in the picturesque mountains, not far away from downtown Palms Springs. It has been recently renovated to capture its 1930’s majesty with plenty of modern amenities. Excellent perks are included in the room rate. Indulge in a 3-course breakfast and complimentary wine at night. Take a break from lounging by the pool with a tour of the ground’s lush gardens. This small luxury hotel is a hidden treasure of the Palm desert, a perfect place for a relaxing retreat or romantic hideaway. If you are looking for Palm desert luxury hotels, the Willows is one of your best options. This joie de vivre Palm Springs hotel is a four-star gem. The bold and modern hotel offers luxurious amenities with unique touches. For example, you can start your morning with complimentary yoga or bike rides. Surrounded by a desert landscape, The Saguaro offers gourmet meals and refreshing cocktails. The Saguaro is also an attractive event location with a variety of spaces available for those looking for top hotels in Palm Springs. You can’t mention Palm Springs luxury hotels without this 4-star hotel. Formerly known as The Curve, V Palm Springs is a bold choice that has revitalized the boutique hotel industry. Trip Advisor highly rates this hotel for more than its luxurious amenities. The location is a huge draw for guests, and it is minutes away from major attractions, such as Coachella Valley. Known for its hip atmosphere, the V provides a low key and stylish getaway and is a top option for the best hotel in Palm Springs. It is easy to see why the Desert Riviera is ranked as one of the best luxury hotels in Palm Springs. Located in California’s Coachella Valley, the newly renovated vintage style hotel has captured the iconic vibe of Palm Springs. Enjoy breathtaking 360 degree views of the San Jacinto Mountains. Relax at the property’s sparkling pool or head to nearby downtown for plenty of shopping and entertainment. This property is an adults only hotel, which means peace and relaxation are the #1 priority. According to Trip Advisor, The Desert Riviera Hotel is perfect for nature lovers with their complimentary bike rides and hiking trails. Located nine miles outside of Palm Springs, this 5 star hotel is still considered one of the top rated Palm Springs luxury hotels. Each guest room at The Ritz-Carlton is filled with indulgent amenities, such as soaking tubs and spacious balconies. With several in-house dining options, pools and full service spa, you will have to remind yourself to get out and do some sightseeing. One of the top resorts in Palm Springs, the Ritz-Carlton has won many awards, such as Trip Advisor’s Certificate of Excellence, among others. The La Maison Hotel is the perfect choice for those look for a Mediterranean style boutique hotel in Palm Springs. The designers set out to make the hotel reminiscent of the south of France, and they were extremely successful! Located near downtown Palm Springs, this four star hotel offers plenty of amenities and strives to exceed every guest’s expectations. In fact, Trip Advisor’s reviews rate the La Maison Hotel highly as a flawless gem and one of the best Palm Springs luxury hotels. Palm Springs is a great travel destination for families, couples or large groups looking for a one of a kind getaway. Home to several attractions, such as Coachella, the desert oasis has plenty to offer. Book your stay at one of the many Palm Springs luxury hotels for a trip that you will never forget.